If you are one of the millions of people who love the video slots, then Slots Plus is the best casino for you. As the name implies, this online casino is all about the slots and here you will find over 300 of them, along with the table games found at any casino. Whether you love the new style 5-reel mufti-line video slots with many bonus features and free spins or the old-school one-armed bandits, Slots Plus Casino has them all in spades. And to make it even sweeter, the casino recently upgraded its bonus offer for new players to the whopping $10,000 in free chips, the highest monetary bonus among the top internet casinos. This bonus offer is based on 400% match on your first deposit and if you plan on depositing big – you will be rewarded. For example, if you start with $500, Slots Plus will automatically add an extra $2,000 and your starting bankroll will be effectively $2,500, not bad deal at all. Even better – your second deposit will give you another bonus, 150% match. 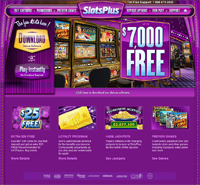 In a nutshell, if you like the video slots and want a big bonus, Slots Plus Casino has got you covered.